How to back up iPhone contacts safely and selectively? If you want to back up your iPhone contacts selectively and safely, you can choose to back up with iFonebox to export and transfer all your contacts to your computer selectively. What is the most important information on your iPhone? Definitely the contacts. 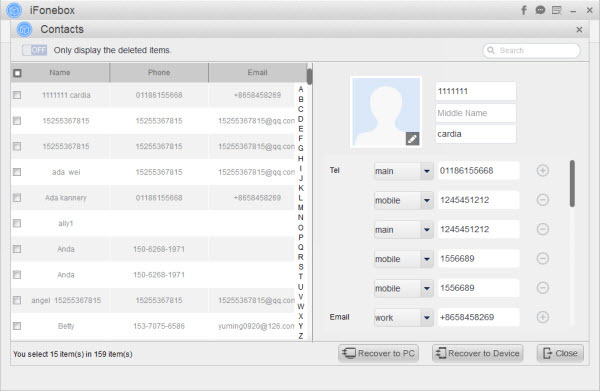 Do you know what is the best way to back up your contacts in case of accidental loss or deletion? Many smart phone users believe that all the contacts are backed up to the phone's SIM card and they wouldn't lose any any contacts information in case of a problem, and it is easy to transfer them to a new phone. On the iPhone, however, this is not the case at all. iPhone does not back up contacts information on the SIM card. Fortunately, it is possible to back up your iPhone contacts, because iPhone makes a backup of its data every time you sync it to your computer and creating an iTunes backup file onto your computer. If you have found that you have lost some or all of your contacts, you can recover the lost contacts by restoring your iPhone from the iTunes backup file you have created previously. Backing up contacts in this way is fine, but getting back your lost contacts by restoring your iPhone is risky, for the restoring process will erase everything on your iPhone. And it cost too much to get back a few contacts items. There are another way to back up and recover iPhone contacts selectively without worrying about data erasing, the professional iOS data recovery software, iFonebox. iFonebox is capable of exporting the contacts from your iTunes backup file and transferring to your iPhone or to your computer as readable file for backup. Note: iTunes backup file is save on the computer on which you synced your iPhone but it is not readable. In other words, if the backup file is not used to restore your iPhone, it means nothing to you. You can firstly download a free trial version of iFonebox to have try before you decide to pay for the full version. 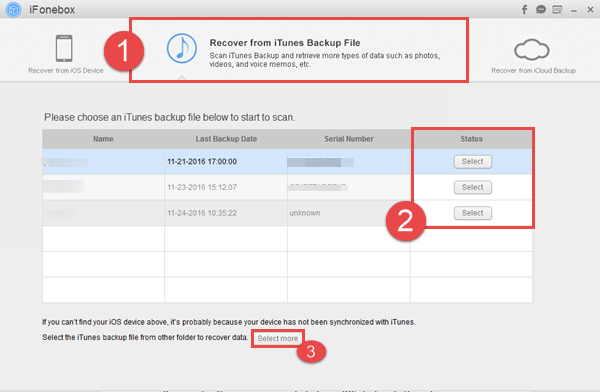 Below are the detailed steps about how to back up iPhone contacts from iTunes backup file selectively and safely. Step 1: Install and run the full version of iFonebox. Choose the recovery mode of “Recover from iTunes Backup”. Choose an iTunes backup file from which you want to export and backup your iPhone contacts. Step 2: Choose contacts to recover by hitting on the icon of contacts. Step 3: Take a preview at the exported contacts items and choose whatever you want to transfer to your computer for backup. You can also do some modifications before transferring the contacts to computer for backup.